The lip is an area of not only cosmetic but also functional importance. Except for raising your eyebrows, frowning, opening and closing your eyelids almost everything important movement of the face involves your lips. The lip area can obviously be divided into the upper and lower lip. There is the actual mucosa or vermillion of the lip, and the skin directly above and below the lip. 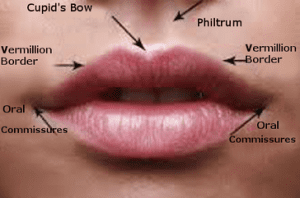 The center of the upper lip known as the Cupid ’s bow and philtrum is a very delicate, intricate, and defining anatomical landmark of the face. Skin cancers can commonly occur on the lip. They can occur on the skin above and below the lip. They can occur at the junction of the skin and the mucosa of the lip known as the white roll. They can also occur on the actual mucosa of the upper and lower lip. 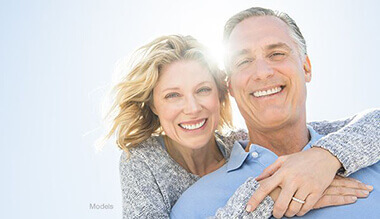 Basal cell carcinomas are the most common skin cancer of the face and the also the lip. Squamous cell carcinoma can occur on the lip, and be particularly problematic on the lower lip. Sometimes the lower lip can have diffuse sun damage also known as actinic cheilitis and be prone to squamous cell carcinomas. Reconstruction of the lip after Mohs surgery will obviously depend on the location and size of the defect. Typical reconstructions will involve linear closures, flaps (where adjacent tissue is moved into place), and rarely skin grafts. Reconstructive goals are maintain the normal contour and outline (white roll) of the lip.